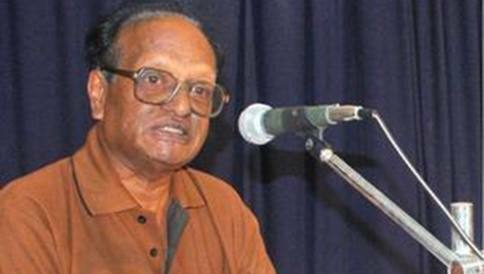 Chandrashekhar Patil is a famous Kannada writer, dramatist and critic. He is a prominent personality in the state of Karnataka, thanks to his unique talent and power packed plays, and his efforts to bring the Kannada language to prominence. Chandrashekhar Patil’s plays are very unique as they are absurdist in nature, and very few artists in India take this route. This is one of the main reasons why he’s seen as a key figure in the Indian theater scene. Chandrashekhar Patil was born in 1939. He grew up a rebel, joining the Bandhaya movement, protesting against the establishment on both the social and artistic layers. He was a student of Linguistics and edited a monthly paper called Sankramana (Transition). He provided a platform for budding Kannada writers, encouraging discussions on art, life and society, even at times courting controversy. He was a Professor of English at Karnataka University, Dharwad. After his retirement, he became the chairman of Kannada Pradhikara. Chandrashekhar Patil makes use of absurdist techniques in his plays in order to provide a satirical take on the society. His play Appa (Father) was inspired by a Vachana piece by the 12th century philosopher Basaveshwara. In this play, a boy named Basava, the son of a prostitute, searches for his father. Gurtinavaru (roughly meaning acquaintances) explores the quirkiness of relationships where friends become estranged by circumstances, and, on the other side of the coin, strangers become friends. Tingara Buddanna (The Dwarf) was based on the famous mythological story of Bhasmasura, in a folk theatre style, depicting how the power of destroying others ultimately turns into self destruction. Almost all of Chandrashekhar Patil’s plays have been adapted into stage plays by various theatre groups in Karnataka, and have also been televised. Chandrashekhar Patil has also written street plays like Nalakaviya Mastabhisheka (Nalakavi’s Consecration). He is known for his lyrical style, for the distinct North Karnataka dialect in his plays, and lines that are laced with humor. Chandrashekhar Patil has served as the President of Kannada Sahitya Parishad and as the Chairman of Kannada Development Authority too.